First to say there are two new item types: surveys and polls. They are slightly different from quizzes. Polls could have only one choice question (btw. you can add more but they won’t be visible), surveys have only a aggregated evaluation. You drill down to a single users participation. Beside that polls show up only if the user not already voted (today) this poll, otherwise the result is shown directly. 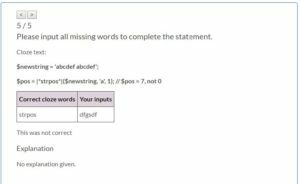 Surveys in opposite to quizzes can’t have a review at end. 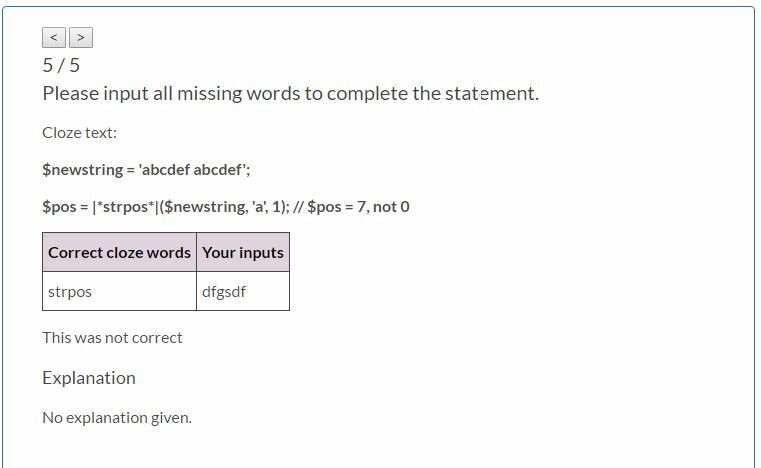 We added a plain text question where the user must type word by word – character by character exactly what you defined in the question editor. But more important is the usage of this type in surveys. There user can input free text as they like. The new cloze text question type will enhance your quizzes. You can write long texts with so much gaps as you need. The user input will be compared character by character for each gap and the user gets only his point if all gaps are correctly filled in. The review mode is completely rewritten and enhanced. If you set ‘Show Review’ to ‘on’ in the quiz editing page users get at the end a review button. By clicking this they can go through the complete list of questions, see their answers and the correct ones and additionally an explanation (but only if you wrote one). 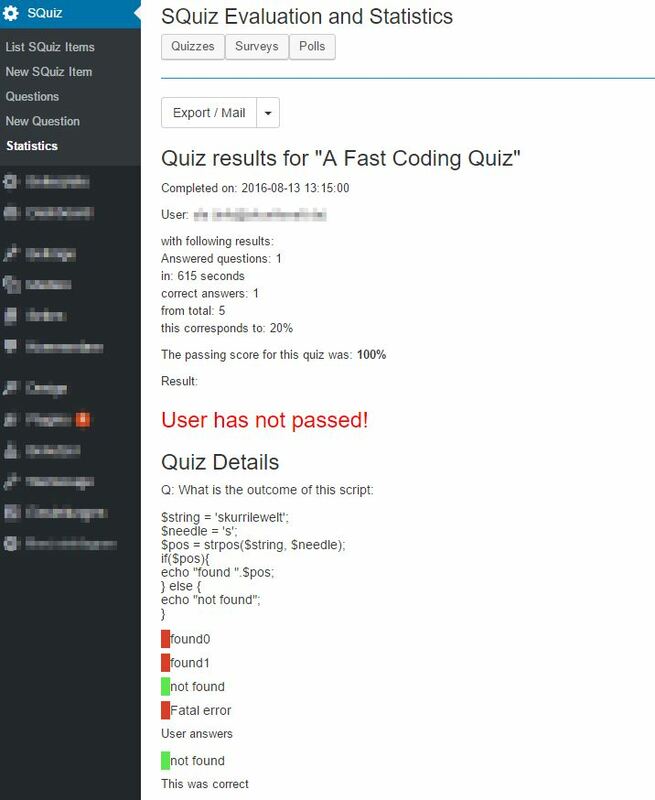 The quiz, survey or poll output on the screen is generated by the template engine Twig. 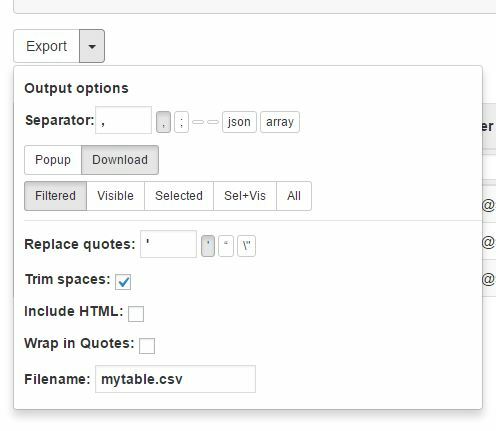 The plugin contains a set of three templates for the three item types. Customizing this is easier as you think: In most cases a new css file with a few styles is enough to create your unique look. Therefor it is sufficient to create a new template folder (yes: empty!) and the stylesheet in another specified folder. Ready with that. The template engine loads missing templates from the standard folder – you must not care about that. For more information please read the docs. 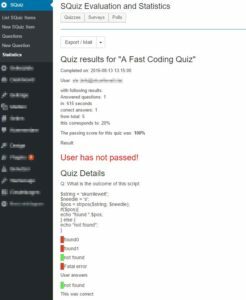 A new question section in the quiz editing view facilitates the selection of questions and improves clarity. Questions and associated filter buttons are colored, additionally you filter by category as combined filters. 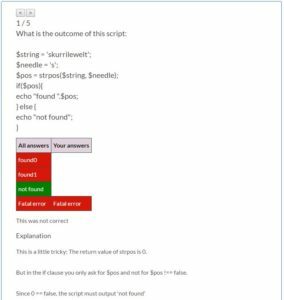 Editing answers is also improved: you get to edit responses the visual editor so that now HTML and media files possible answer content. The stats section is completely renewed. All item types have their specific evaluation. Quizzes are well organized in a accordion and in there a sortable table with pagination and filter with the participations. Every participation can be viewed in a details version and gives you information about all questions a user answered, if he has passed or not and so on. You can mail this detail view directly to the user if you like. 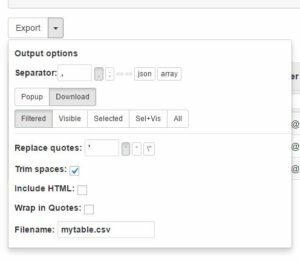 All tables and evaluations can be exported with a single click to csv. You can choose between export of a filtered list or the complete result list. 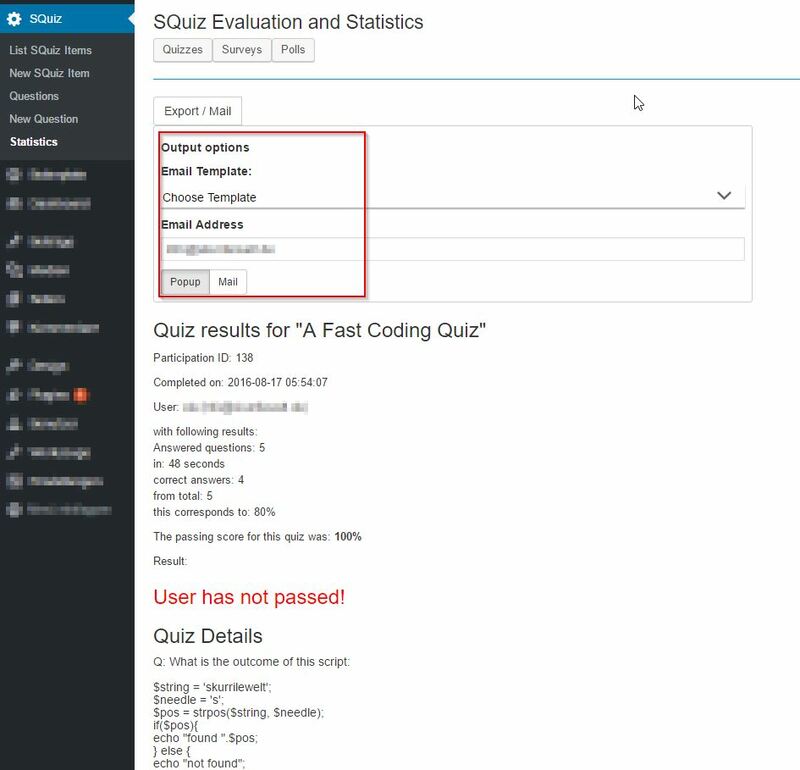 Quiz evaluation can be drilled down to a single user participation. You can see a complete review of a single quiz on one page. Additionally you can send a copy of that via email to the user. The popup will give you the html markup as seen on this page. The mail option sends an email build on choosen template ( see Templates ) to the specified email address. If a logged in user makes a quiz his data will be available here otherwise you have to input data manually. If you have any suggestions about new features please leave a comment. 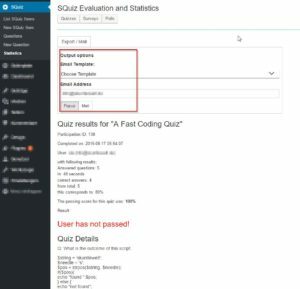 We are proudly present the completely new written WordPress Quiz Plugin SQuiz 3. Development is nearly finished, now we run intensive tests and do a little bit finishing. Statistic and evaluation is now enhanced, with filterable tables, export functions and diagrams. The frontend uses the TWIG templating engine. You can create as much templates as you need, to let the layout follow your quiz or survey. SQuiz uses the template overloading mechanism, so that you only need to customize the parts you really need. Because of the completely rewritten engine this is installed as a new plugin and NOT as update. The database structure differs so that you can not use old questions and answers out of the box. The codecanyon.com review process will start soon. 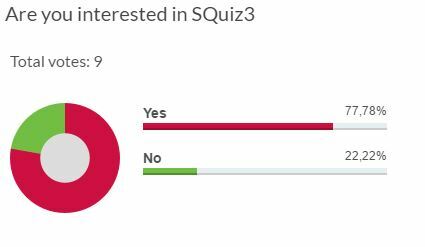 If available, would you purchase SQuiz3?